﻿ HuntingNut » Forums » Firearms, Shooting & Reloading » Reloading Ammunition » 6.5 Creedmoor anyone? Posted: Thu Sep 20, 2018 12:40 pm Post subject: Re: 6.5 Creedmoor anyone? Tikkas are a smooth as silk, Grey_Wolf. I love mine and its 1/2 MOA if I get the loads optimized. Posted: Thu Sep 20, 2018 7:00 pm Post subject: Re: 6.5 Creedmoor anyone? Oh I know! I bought my son one for his 18th birthday, it was his first rifle. Took him to the gun store and told him to pick up as many guns as he could to shoulder and get a feel for and we'd get the one that felt the best. He picked the Tikka. Posted: Fri Sep 21, 2018 12:52 am Post subject: Re: 6.5 Creedmoor anyone? what I was TRYING to get at is be realistic and dont get sucked in by the hype...at the end of the day is pretty much a 6.5x55mm give or take a little bit. Posted: Fri Sep 21, 2018 7:18 am Post subject: Re: 6.5 Creedmoor anyone? Ah Ok. Nope not getting sucked in. determined to be a 6.5 whether a 6.5x55, 260 Rem or 6.5 Creedmoor I guess doesn't make that much difference just a non magnum cartridge. The first two were on the list because I know they have low recoil, wasn't sure about the Creemoor. Any of those should fit the bill for intended use. truthfully I had originally thought about the 6.5x55 because I had one and it was very easy on the shoulder but then started thinking that maybe the 260 would be better cause it's a short action, then someone brought up the Creedmoor and it's a short action, and round and round we go lol, And just haven't known anyone that shot one so I asked and maybe derailed this thread - oops sorry op. Posted: Fri Sep 21, 2018 11:22 am Post subject: Re: 6.5 Creedmoor anyone? not an issue bud...we all get off track at times and your questions are more relevant than my answers LOL..... speaking of sore on shoulder....have a good look around the site I sent link too,the article on hold that forend is pure gold. Posted: Tue Oct 02, 2018 9:17 am Post subject: Re: 6.5 Creedmoor anyone? For when I need to make a hole in something WAAYYY over there... Ruger Precision Rifle in 6.5 Creedmoor w/ Burris Veracity 3-15 x 50mm. Haven't even had a chance to shoot it yet. I doubt it will see much hunting, unless I try it for varmints somewhere. 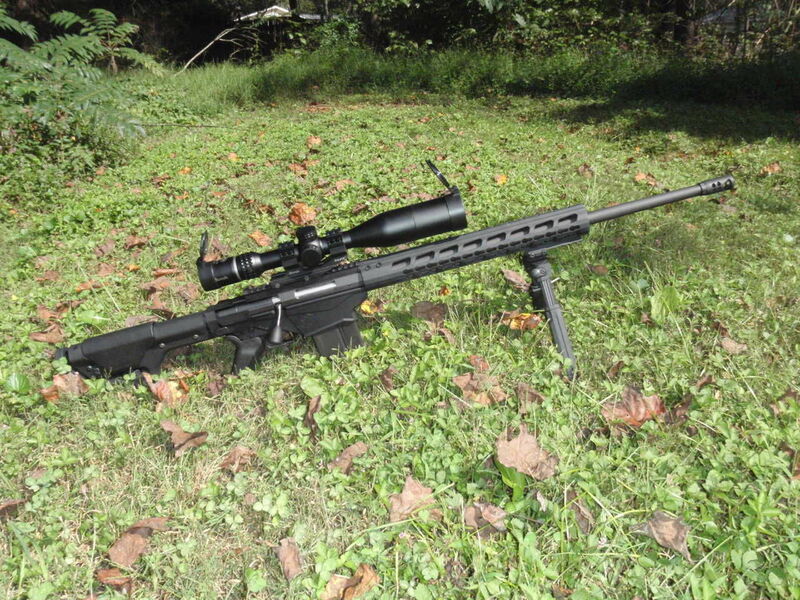 Posted: Tue Oct 02, 2018 9:28 pm Post subject: Re: 6.5 Creedmoor anyone? That is one beautiful rifle, Pumpkinslinger! Posted: Wed Oct 03, 2018 5:34 pm Post subject: Re: 6.5 Creedmoor anyone? That looks sweet Punkin, very sweet indeed mate.